This is the first time I am working during the school holidays! I took Kate along with me to our enrichment centre for Dino camp, but she stayed home last week while we ran our P1 Prep camp. So how do I squeeze in time for her and the other kids during the week? It helps tremendously that I don't have to stick to a 9-5 work week, and depending on the demands of the day, I either get in an hour or two later or leave earlier and resume working at home after they have gone to bed. Even though it is the holidays, Kate and #5 are up by 7.15am. Resisting the urge to sleep in, I think of the hours I'll be away from them and that never fails to get me out of bed. There is nowhere much to take them that early in the morning, hence it's always some park or other. This little monkey shimmied to the top of the pyramid by herself and called down, "Mum, take a picture of me!" She sure is catching up with the older siblings. Instead of rushing to finish breakfast before heading out, we hastily pack a picnic basket with breakfast staples and hop into the car. In that relaxing hour, we get to spend time together, have a proper breakfast and enjoy the benefits of nature. It really helps that the hubs works from home and instead of rushing back to pick the kids and getting stuck in peak hour traffic, we arrange to meet at the destination and have time to enjoy the outdoors before heading home for dinner. Sometimes we ask the grandparents to join us, or if the kids end up with friends or aunts, we find somewhere convenient for the kids to play or for a quick dinner together. 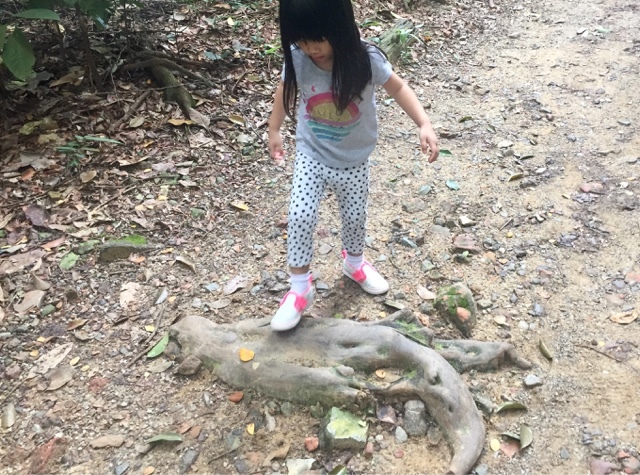 We were trekking through MacRitchie reservoir and Kate was convinced that she found a Dinosaur foot! When I'm not at home, it doesn't mean that I'm disconnected from them. Kate's obsession this holiday is rollerblading. She loved watching Elsa ice-skate during Disney on Ice and has been asking to go ice-skating every other day. After taking her there 4 times (I'm the one exhausted!) I told her she needs to practice with her rollerblades before I'll consider taking her back. 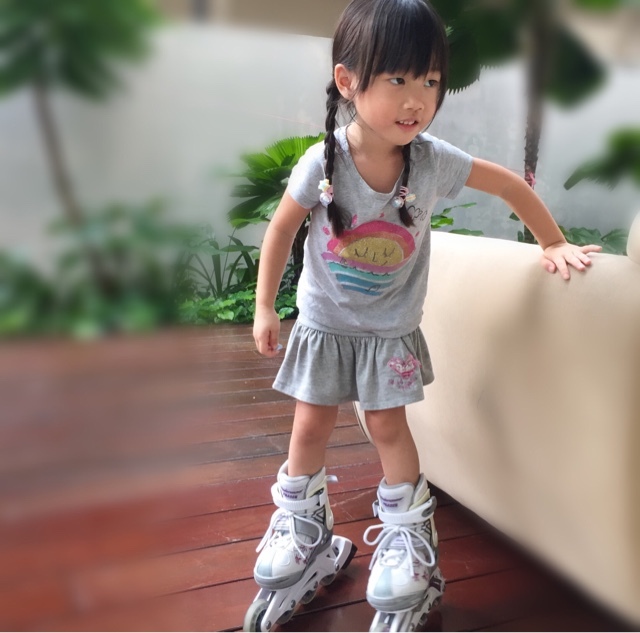 She was so motivated that she spends 1-2 hours per day on her blades and when I get home, she is ever eager to show me how much she's improved. What a great attitude. Looks like I have to take her ice-skating soon, as promised! As the kids grow older, they require less and less face-to-face time with you. Any parent of a teenager will tell you that they spend a lot more time in their rooms and communicating with their friends via gadgets. However, this doesn't mean that we stop being involved in their lives. 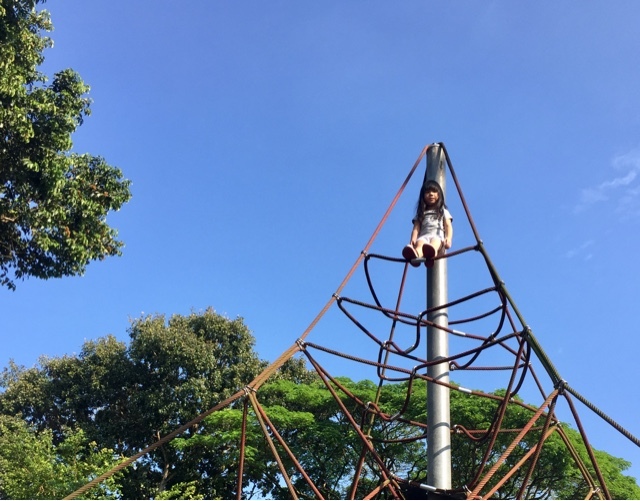 #3 was lamenting that besides filling her time with clocking the required CIP hours and meeting up with her old friends from primary school, she was bored at home as I am not able to take them out nor go on holidays as #1 is not on term break. I simply told her to start thinking, and find something gainful to do, make or sell. 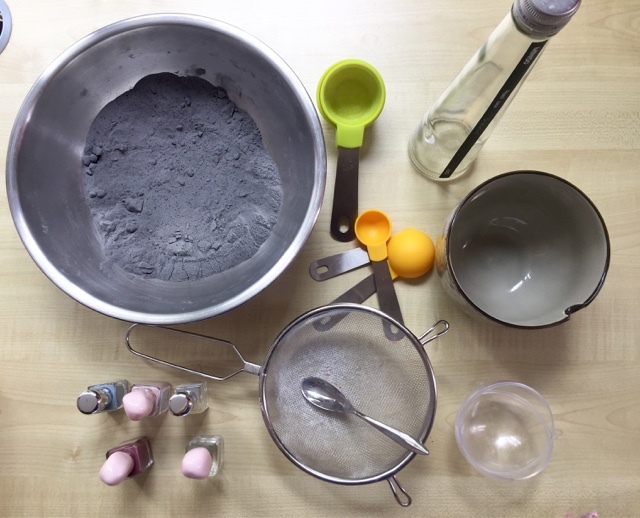 She started experimenting with home beauty remedies and came up with products to gift her friends, and that led to some orders as well! I encouraged her and told her I was very proud of her efforts. These days, with technology, we can still stay connected even while we are at work. For teenagers, to be there for them on a daily basis means being able to reply their Whatsapp messages when they need advice or permission to go out with their friends. Sometimes, it's me who needs advice from them about using technology to make videos or helping me to buy presents online for my staff for Christmas, and that's how we update one another about what is going on in our lives. Even though I only get to see all my kids during dinner, I keep up-to-date with what they are currently interested in and give them words of encouragement and support. #2 has just finished her Os and she has the next few months planned out. Last week, she was concentrating on decorating her room as the siblings have just done another round of roommate swopping (yes, it seems to be an annual tradition for them). She was happily showing me what she has been working on and I was extremely impressed. Instead of spending money on decorations for her room, she decided to make her own. 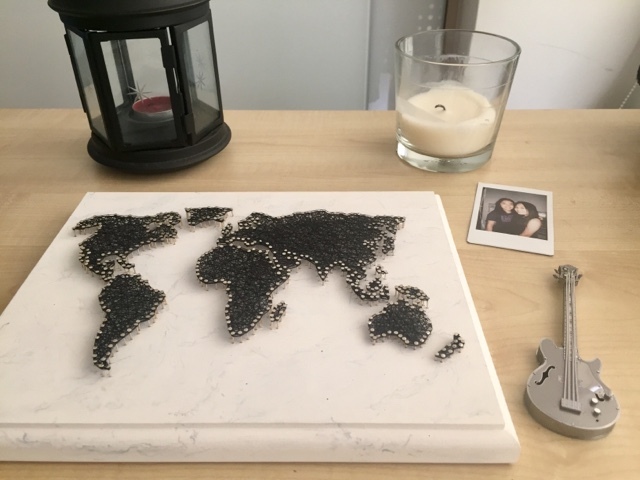 She bought a wooden board ($4 from Art friend), painted it marble, and knocked little nails in it to form the world map. 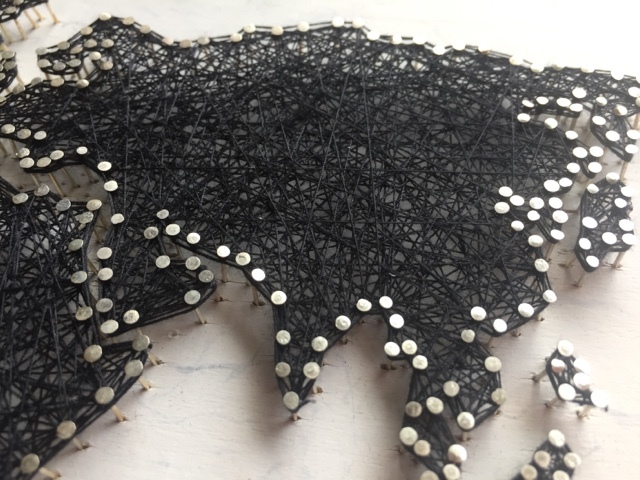 She painstakingly wound black thread around the nails, ensuring that they were taut, to form the design. Wow. I loved it, and told her so. Sincere words are food for the soul they carry with them through the day, even without the presence of mummy. Sometimes it is encouragement they need, while other times, it may be words of concern and care. 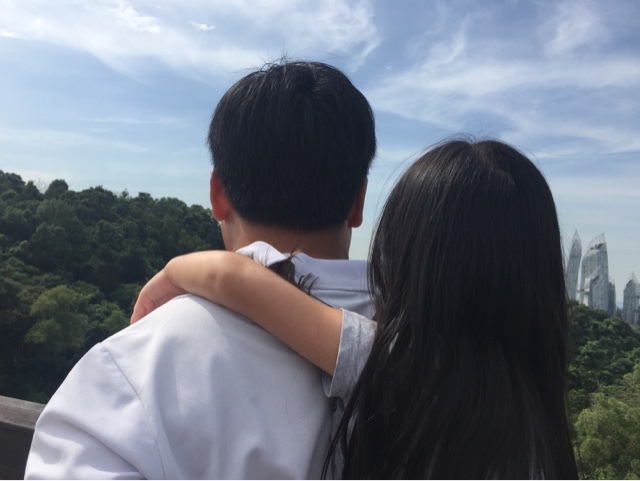 To be honest, I was caught off guard at how much easier it was to go to work, be tired, and spend the weekend resting, and not having to deal with the day-to-day demands of the kids at home. However, I am wary that it is all too easy to let this pattern slip into our norm, as the time we have with our children will never be returned, once lost. Having these pockets of time to be still, to be present to our surroundings is very grounding for me, no matter how rushed my day is nor how tough things can get sometimes. Even though these days I'm away between 5-9 hours per day, I'm glad we've managed to work things around this new schedule and am able to spend a reasonable amount of time with the younger kids throughout the week. 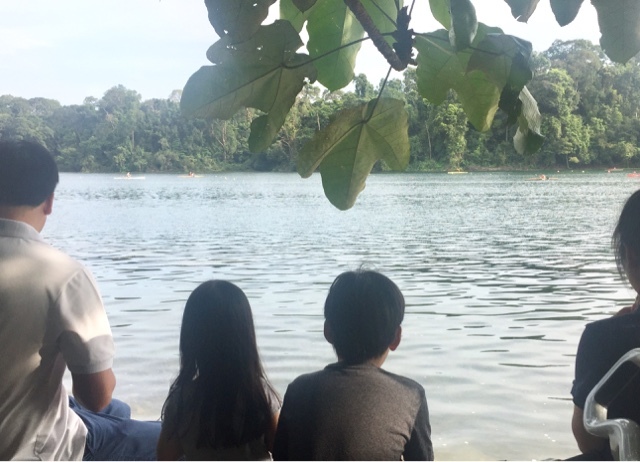 I am thankful to have flexible working hours and support from the hubs in caring for them, but whatever your situation may be, try to think out of the box and perhaps you might find opportunities to squeeze time out for your kids during their school holidays. 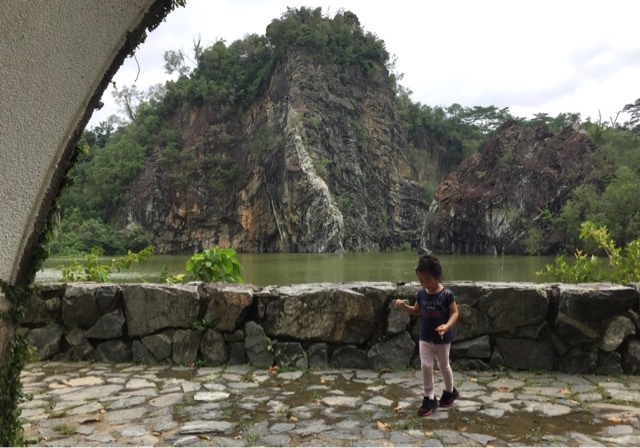 Our June holidays earlier this year where everyone was running at breakneck pace.